According to a new market report published by Transparency Market Research , “Oil Filter Market - Global Industry Analysis, Size, Share, Growth, Trends, and Forecast, 2018 – 2026” is expected to reach US$ 5.3 Bn by 2026, expanding at a CAGR of 3% during the forecast period. 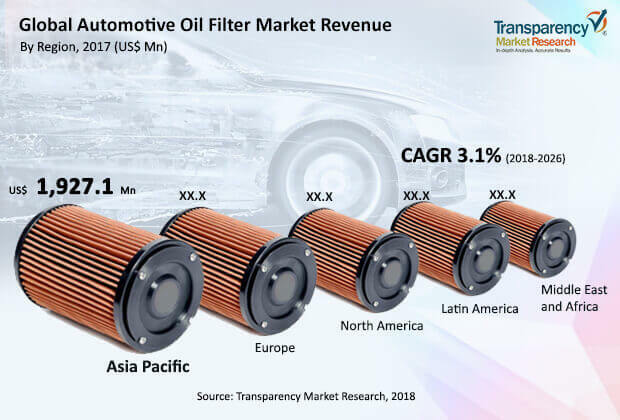 The global oil filter market for automotive is projected to expand at a CAGR of 3% between 2018 and 2026, according to a new research report by Transparency Market Research (TMR). According to the report, the global market is likely to be influenced by a range of political, economic, social, technical, and industry-specific factors. Latin America is expected to witness rapid rise in demand for oil filters, with the market in the region anticipated to expand at a CAGR of 3% during the forecast period. Stringent carbon emission norms, leading to lowered carbon emission levels, are expected to propel the overall oil filter market for IC engine vehicles. China 5 standards for emissions, which are similar to Euro 5, were implemented to new vehicles sold in the country, in January 2017, for gasoline engines. These standards are applicable for diesel engines from January 2018. China has mandated real-driving emissions testing modeled after the EU RDE regulations with a few enhancements and modifications with the implementation of these norms. In March 2014, the U.S. EPA finalized new emission standards for vehicles and fuels, commonly referred to as Tier 3 emission standards. This is anticipated to reduce both tailpipe and evaporative emissions from passenger cars, light-duty trucks, medium-duty passenger vehicles, and some heavy-duty vehicles. A well maintained and properly functional oil filter is required to cooperate with the norms mentioned above. Rising amount of greenhouse gases and carbon footprint has led to the development of electric vehicles, which are predicted to impact the IC engine vehicles market in the next five to seven years. The oil filter market for automotive in some regions is expanding at a moderate pace, owing to limited usage of some oil filters such as fuel filter and engine oil filter in electrical vehicles. This, in turn, is likely to impact the demand for oil filters. However, the demand for hydraulic filters and coolant filters are anticipated to rise owing to the increase in production of vehicles. The oil filter market for automotive can be segmented based on fuel type, filter type, sales channel, vehicle type, and region. Based on fuel type, the diesel segment is likely to dominate the market by the end of the forecast period. This is primarily due to its major application in commercial vehicles. It is expected to expand at a CAGR of more than 3% and in terms of revenue, the segment is estimated to reach near to US$ 3 Bn by 2026. In terms of filter type, the fuel filter segment holds a prominent share, and its market share is likely to reach about 40% of the market by 2026. The fuel filter is responsible for cleansing of fuel before entering into the engine cylinder for combustion. Combustion of clean fuel is expected to create lesser carbon emissions. The passenger vehicles segment held 71% share of the global market in 2017. Impurity of the fuel left after fuel refinement and contamination of fuel while transporting are primary concerns. Moreover, passenger cars have to adhere to stringent emission norms in order to minimize environmental pollution. Consequently, various filters such as coolant filters are being utilized in passenger cars to maintain the low temperature of vehicle components. The usage of automotive filters is increasing at a steady pace owing to the rise in production of passenger cars. These factors are responsible for the dominance of the passenger vehicle segment among the vehicle type segments. The electric vehicle segment is likely to expand, owing to government subsidies and policies in several countries. Demand for oil filters in the electric vehicle segment is likely to witness marginal growth, due to elimination of usage of fuel filter and engine oil filter in electric vehicles. The aftermarket segment leads the market, and was valued at US$ 21 Bn, in terms of revenue, in 2017. The oil filter needs to be replaced periodically as it gets contaminated due to foreign particles. The aftermarket segment holds a major share of the market due to the need for regular replacement of oil filter. Based on geography, the global oil filter market for automotive can be segregated into North America, Latin America, Europe, Asia Pacific, and Middle East & Africa. Asia Pacific held a major share of the global market in 2017. Increase in demand and production for vehicles in the region coupled with rise in demand for environment-friendly vehicles in some of the prominent countries in Asia Pacific, and the rise in mass production methods such as assemble line production are major factors that are driving the market in Asia Pacific. Development in the materials, combination of its use, and the design of the filter are driving the technological development of automotive filters. The global oil filter market for automotive is highly fragmented due to the presence of small- and medium-scaled manufacturers. Major share of the automotive oil filter market is held by local manufacturers, as they are present in large numbers. Major players operating in the global oil filter market for automotive include Sogefi SpA (Italy), MAHLE GmbH (Germany), MANN+HUMMEL GmbH (Germany), A.L. Filter (Israel), Robert Bosch GmbH (Germany), Donaldson Company, Inc. (U.S.), North American Filter Corporation (U.S.), Fildex Filters Canada Corporation (Canada), K&N Engineering, Inc. (U.S.), Filtrak BrandT GmbH (Germany), Luman Automotive Systems Pvt. Ltd. (India), ALCO Filters Ltd. (Cyprus), and Siam Filter Products Ltd., Part. (Thailand).